Attack On Titan 2 Gameplay and Character Creation Trailers | Nerd Much? Koei Tecmo has released two new trailers for Attack on Titan 2, showcasing the dense battle experiences players can look forward to and character creation details. In this game, you play the part of your own custom scout, offering a fresh perspective on the iconic events you will be witnessing throughout the game. 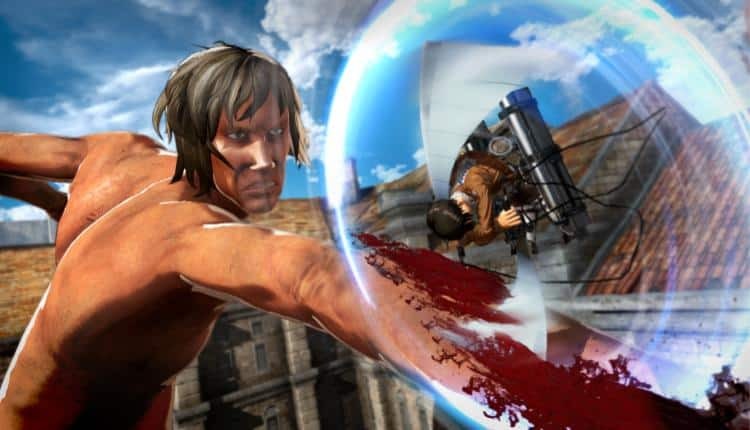 In combat, Attack on Titan 2 features the Mini-Directional Mobility Gear (ODMG). The OGMG allows players to essentially “fly” around their titanic foes, executing the perfect attack to take down the giants. In the combat focused trailer, we can see the player character working alongside Eren and Mikasa as they fight off a swarm of Titans. We even get to see Eren turn into his powerful Titan form, damaging every enemy in his way. Attack on Titan 2 will also have online multiplayer elements, including a game mode called Annihilation Mode. The latter is a 4v4 mode where players must take town Titans and capture bases, aiming for the highest score to win. You will really have to master the ODMG to win rounds in Annihilation Mode. Story mode has a co-op feature as well, allowing players to play with their friends and help each other take down tougher Titans and complete the main story together. This is the perfect mode for the Nintendo Switch, a console that makes co-op as easy as handing the Joy-Con over to another player. Both of these modes will be available at launch, with more coming afterward like a mode where the player gets to control a Titan instead. Koei Tecmo will be offering a special bonus for those that purchase Attack on Titan 2 at select retailers. However, the publisher has yet to announce which retailers are included. The bonus is an in-game pack of plainclothes for Eren, Mikasa, Armin, and Levi. Attack on Titan 2 is coming out soon, on March 20, 2018 for the PS4, Xbox One, PC, and Nintendo Switch.